A normally fragile quantum state has been shown to survive at room temperature for a world record 39 minutes by Oxford University researchers. An artistic rendition of a 'bound exciton' quantum state used to prepare and read out information stored in the form of quantum bits. Scientists have managed to keep a qubit in a superposition state for 39 minutes. The previous record for maintaining an atom in this state is 2 seconds. This experiment is a big step forward for quantum computer technology. Quantum computers are different that current computers (classical computers) in that information is stored in quantum bits (qubits) rather than in binary bits. Classical computers use bits that stores information in either an on or off state. A qubit ,aside from having an on and off state, can be in a superposition state where it can be both 1 and 0 at the same time. 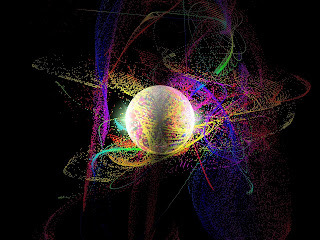 Photons, electrons, and atoms have been used in various experiments to serve as qubits. In this case, the nuclei of a phosphorous atom in silicon was used as a qubit. This superposition property of qubits is what makes a quantum computer powerful. Calculations and procedures can be done in fewer steps by a quantum computer compared to a classical computer. A calculation that may take 1 million steps for a classical computer to do, can be done in one step for a quantum computer. Maintaining qubits in a superposition state has been a major obstacle in quantum computer technology. By being able to hold a qubit in this state for 39 minutes is a major breakthrough in the development of practical quantum computers. Long term information storage by qubits can be made possible because of this. An international team including Stephanie Simmons of Oxford University, UK, report in this week's Science a test performed by Mike Thewalt of Simon Fraser University, Canada, and colleagues. In conventional computers data is stored as a string of 1s and 0s. In the experiment quantum bits of information, 'qubits', were put into a 'superposition' state in which they can be both 1s and 0 at the same time – enabling them to perform multiple calculations simultaneously. In the experiment the team raised the temperature of a system, in which information is encoded in the nuclei of phosphorus atoms in silicon, from -269 °C to 25 °C and demonstrated that the superposition states survived at this balmy temperature for 39 minutes – outside of silicon the previous record for such a state's survival at room temperature was around two seconds. The team even found that they could manipulate the qubits as the temperature of the system rose, and that they were robust enough for this information to survive being 'refrozen' (the optical technique used to read the qubits only works at very low temperatures). '39 minutes may not seem very long but as it only takes one-hundred-thousandth of a second to flip the nuclear spin of a phosphorus ion – the type of operation used to run quantum calculations – in theory over 20 million operations could be applied in the time it takes for the superposition to naturally decay by one percent. Having such robust, as well as long-lived, qubits could prove very helpful for anyone trying to build a quantum computer,' said Stephanie Simmons of Oxford University's Department of Materials, an author of the paper. 'This opens up the possibility of truly long-term coherent information storage at room temperature,' said Mike Thewalt of Simon Fraser University. The team began with a sliver of silicon doped with small amounts of other elements, including phosphorus. Quantum information was encoded in the nuclei of the phosphorus atoms: each nucleus has an intrinsic quantum property called 'spin', which acts like a tiny bar magnet when placed in a magnetic field. Spins can be manipulated to point up (0), down (1), or any angle in between, representing a superposition of the two other states. There is still some work ahead before the team can carry out large-scale quantum computations. The nuclear spins of the 10 billion or so phosphorus ions used in this experiment were all placed in the same quantum state. To run calculations, however, physicists will need to place different qubits in different states. 'To have them controllably talking to one another – that would address the last big remaining challenge,' said Simmons.